Credit Union Advertising: MDG Makes Multimedia Movie Magic With IBM Southeast Employees' Federal Credit Union's Mortgage Promotion. Second In A Series Of Eight. 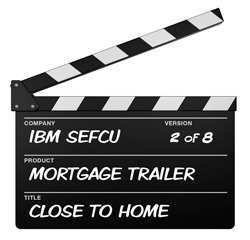 Credit Union Advertising: MDG Makes Multimedia Movie Magic With IBM Southeast Employees’ Federal Credit Union’s Mortgage Promotion. Second In A Series Of Eight. Click the clapper to view today’s featured trailer “Close to Home”. Michael Del Gigante is president and executive creative director of MDG Advertising, a full-service South Florida advertising agency with offices in Boca Raton and New York City. MDG specializes in developing targeted Internet solutions, exceptional creative executions, and solid branding and media-buying strategies that give clients a real competitive advantage. For more information, Contact MDG Advertising.